Download our free and clear Malacca map showing Malacca Hotels, Places of interest in Malacca Malaysia, Melaka Tourist Centre and public places like bus, taxi, post office, train and police station. Click map to enlarge and download big Malacca map (1144×755 – 142kB): ideal to print out and have your Malacca map ready and marked before you go on holiday to Malacca. The below Malacca hotels are featured on the Malacca map beginning from left to right and top to bottom. The Tranquerah Mosque is a mosque in Malacca built with Sumatra elements in its style. A rich heritage museum located right in the heart of Malacca town, a short trishaw ride from the Malacca bus terminal. Malacca’s open design concept of a market complete with facilities, such as escalators, PA system and public toilets. Grave of another Malacca Warrior who like Hang Jebat, Hang Tuah, Hang Lekir and Hang Lekiu were Malay martial arts practitioners called ‘silat’. The A’ Famosa fortress was built during the Portuguese rule over Malacca. Malacca’s Dutch legacy is very much alive in the distinctive red building called the Stadhuys, constructed in 1650 as the residence of the Dutch Governor and his deputy. St. Francis Xavier was buried in the open grave here in 1553 before his body was transferred to Goa in India. 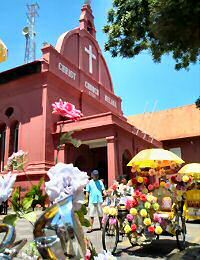 The church has stunning view of Melaka. Situated adjacent to the Stadhuys, this bright red structure is testimony to Dutch architectural ingenuity. Interesting features include the church’s handmade pews, ceiling beams (constructed without joints), brass bible, tombstone and ‘The Last Supper’ in glazed tiles. A museum dedicated to Chinese mariner Admiral Cheng Ho, who visited Malacca six times during the 15th century. Houses an exhibition that traces the history of the Malaysia’s journey to independence. The largest Chinese cemetery outside of China. As the name implies, ‘Chinese Hill’ was the official settlement of the entourage that arrived with the Chinese Princess Hang Li Po. During the height of the Chinese-Malaccan relations, Sultan Mansur Shah married Hang Li Poh, a Chinese princess. Built by the followers of Hang Li Po, the well was the only source of water during great droughts. After a siege of 7 months the Dutch East India Company conquered this fort in 1641, repaired it and stayed in power for the next 150 years. To the west of downtown Malacca, the Portuguese descendants founded their own settlement in the 1930s. Interesting evening trip to “Medan Portugis” to have a feast in the various Portuguese seafood restaurants. Nothing much to see, it’s all about the people and their delicious food. Portuguese Square has a mild affinity to Portugal and known to be ‘Mini Lisbon’ in Malacca. Were you looking for a more detailed Malacca road map, Malacca city map or any other map of Malacca: find it in our Malacca Maps directory.